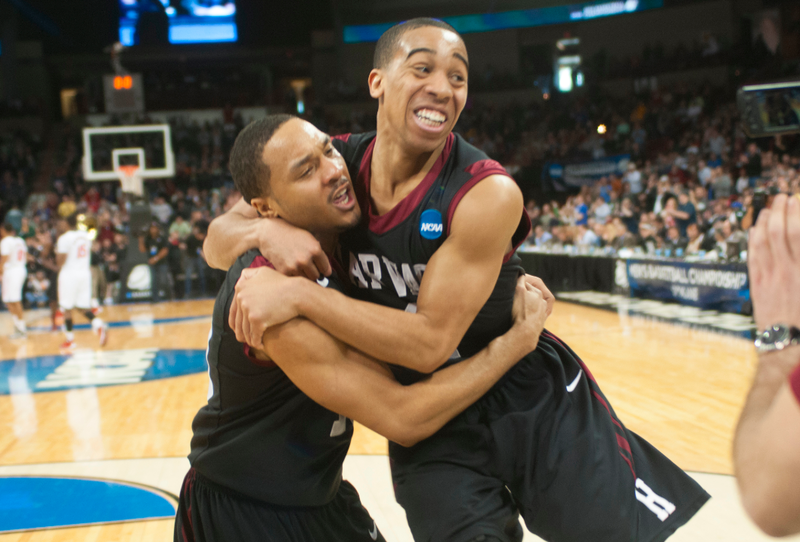 Former co-captain Brandyn Curry ’13-’14, left, was traveling through Holland when he heard the news that the Crimson was going to the NCAA Tournament once more. Brandyn Curry ’13-’14 was on a bus somewhere in Holland. His Dutch team had an 8 p.m.game (three EST) Saturday, so Curry was getting on the bus for an hour-long ride as Yale took a halftime lead over the Harvard men’s basketball team 3700 miles away in the Ivy League playoff game at The Palestra. When the Crimson rebounded in the second half and eventually grabbed a nine-point lead, the former Harvard point guard breathed a sigh of relief. Ok, he told himself, this is good. Then he hit refresh on his Twitter app, and Yale scored. Another tap and another pair of Yale points. Relive the best moments from the regular season in photos, narrated by Crimson men's basketball beat writer David Freed. Just a week earlier, Curry had watched as the Bulldogs held off Harvard in a crucial late-season matchup. Curry had watched all of the team’s Ivy games to that—staying up until 2 a.m. watching online streams—and constantly talked with the team’s current point guard, junior co-captain Siyani Chambers. But after watching the Crimson lose control of its destiny with the loss to Yale, Curry could not watch the team’s Senior Night game the following night against Brown. He was too upset, and he had an early game the next day. Instead, Curry woke up Sunday morning to a dozen texts, including one from Chambers, explaining that the Bulldogs had lost to Dartmouth on a buzzer beater the night before—that Harvard’s NCAA Tournament chances were still alive. “Only in the Ivies,” Curry said, who experienced that craziness himself when a Penn loss on the final day of the Ivy season in 2012 sent Harvard dancing for the first time in 66 years. Fast forward back to Saturday’s playoff, and the Crimson seemed to be losing the opportunity Dartmouth had given them as Yale closed the gap in the game’s final minutes. All this time, Oliver McNally ’12 was playing in the championship game of a basketball tournament in Portland. The former Crimson guard briefly played professionally in Canada before moving to San Francisco to work in sales at a technology company. While playing in the athletic club tournament, he got updates about the playoff game at every dead ball. Still, he didn’t see how the game ended until he pulled up the highlights on his phone. When Curry saw that Moundou-Missi had hit the game-winning shot, he jumped up on the bus. The rest of his teammates, resting with their headphones on, all turned to look at him. Curry said he does not have any sympathy for the way Yale’s season came to an end, but McNally, a junior when Harvard lost to Princeton a buzzer-beater in the 2011 Ivy Playoff Game, felt otherwise. He said his first thought upon seeing the highlights was how happy he was for Harvard. But his second thought went out to the Bulldogs.